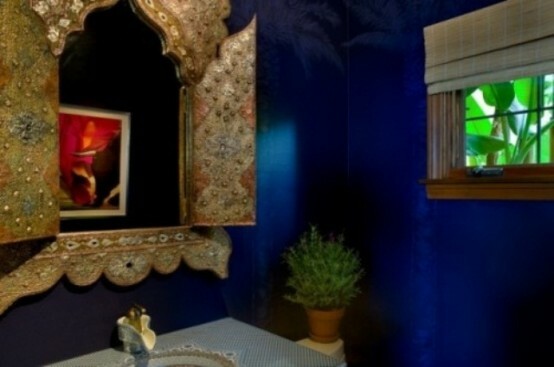 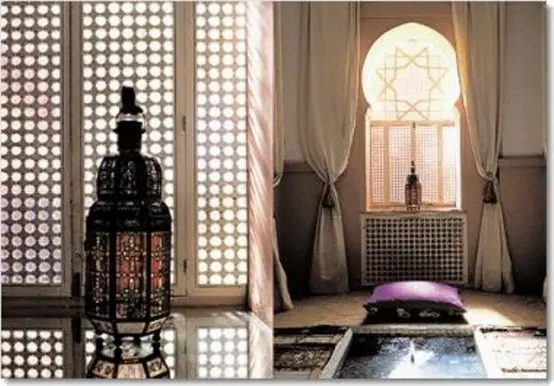 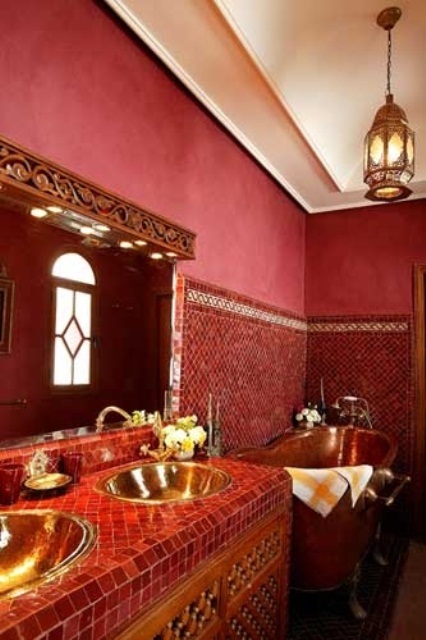 We continue telling you about luxurious interiors of Moroccan style. 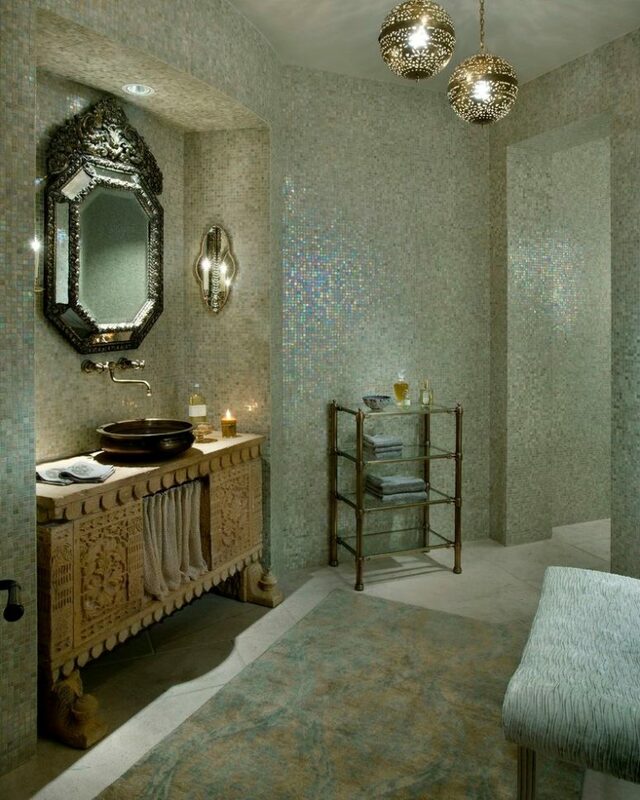 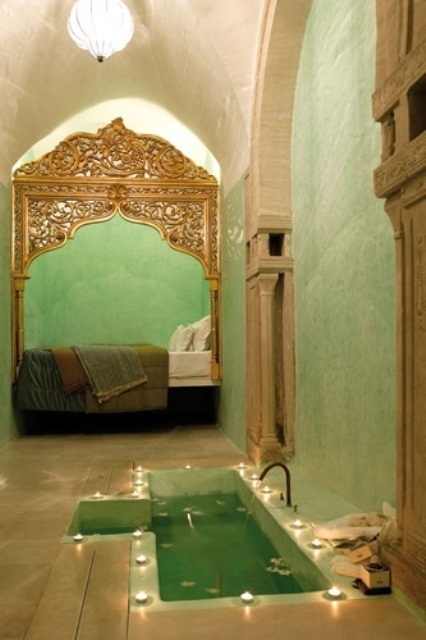 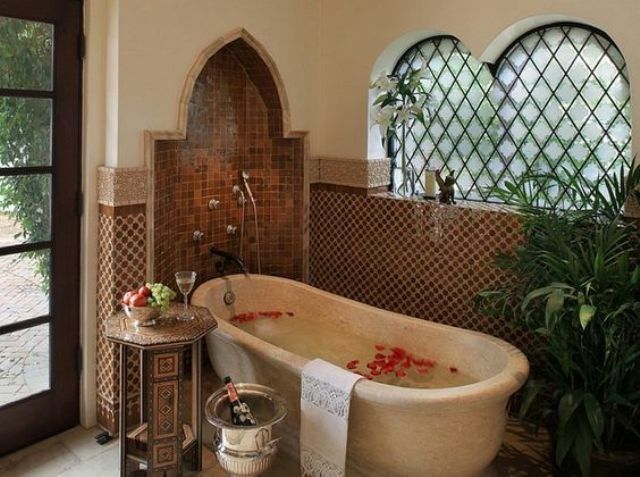 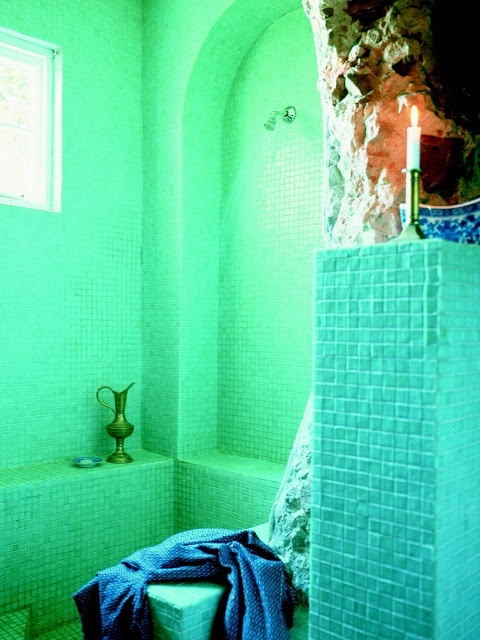 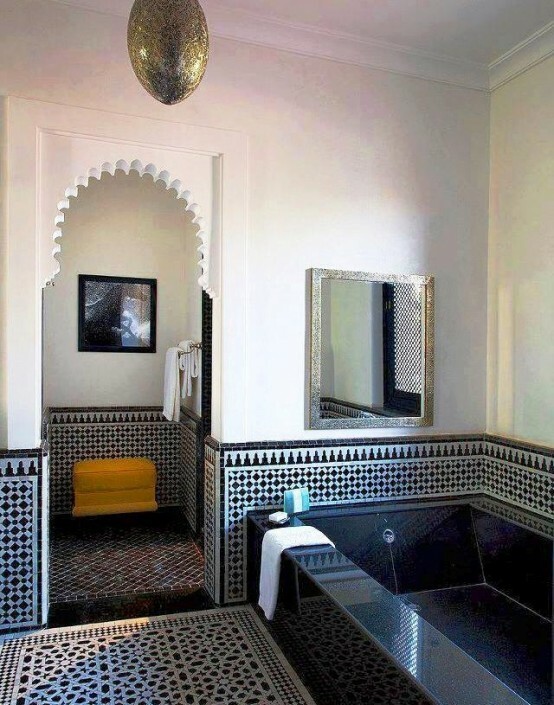 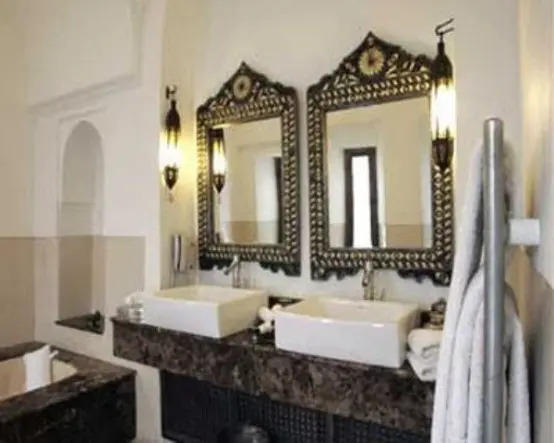 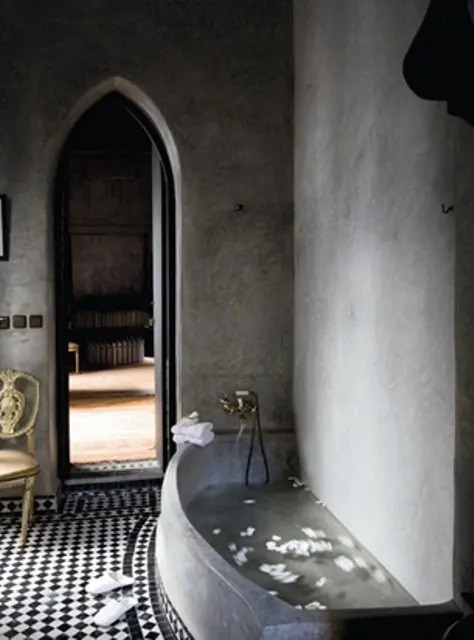 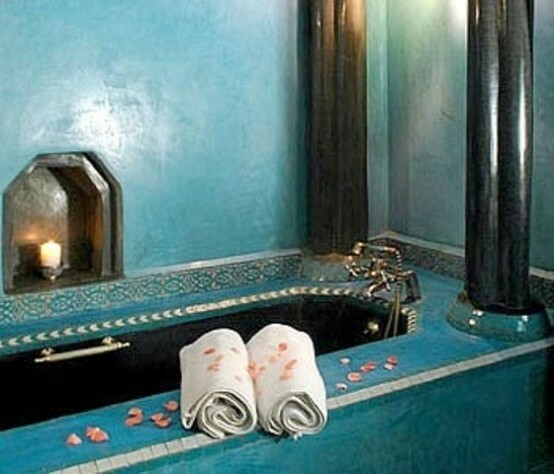 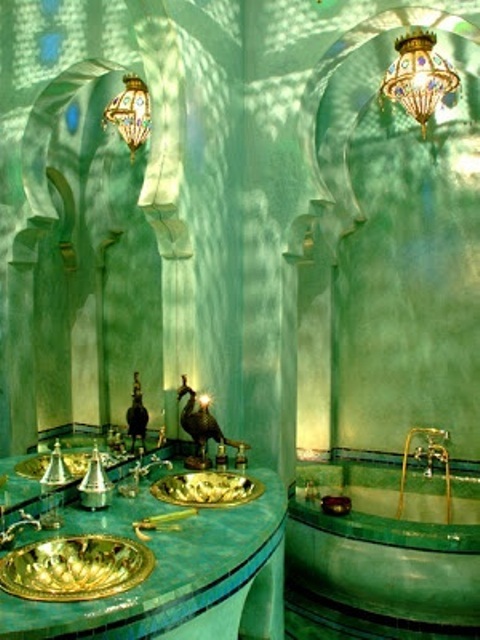 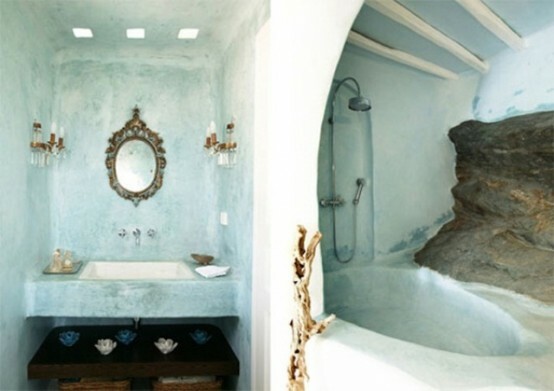 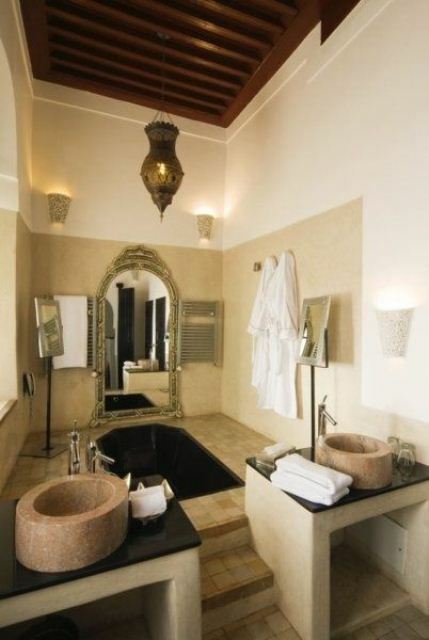 This time we’ll talk about Moroccan bathrooms which make you think of spa and wonderful relaxing experience. 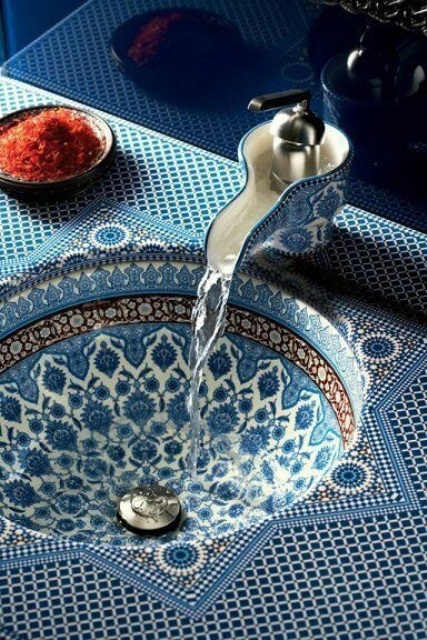 How can you achieve such an impression? 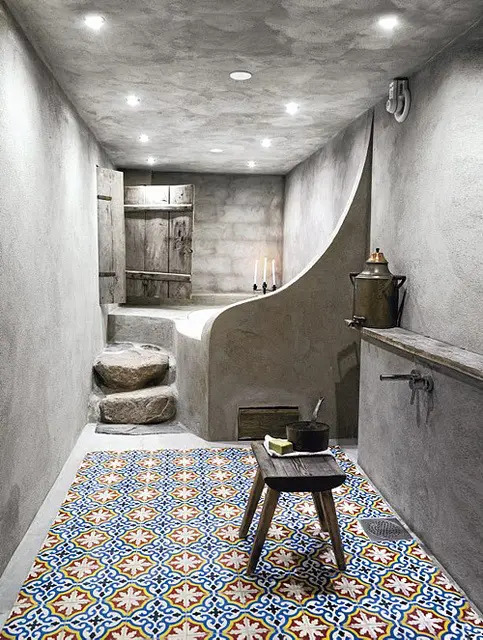 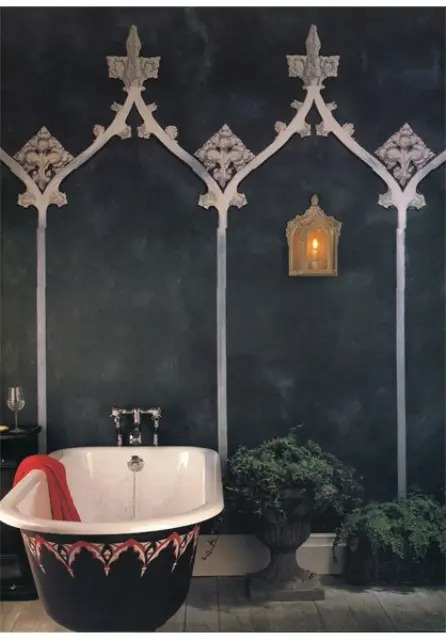 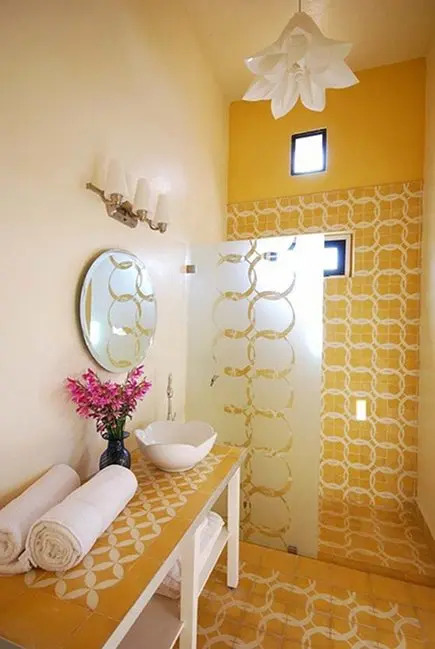 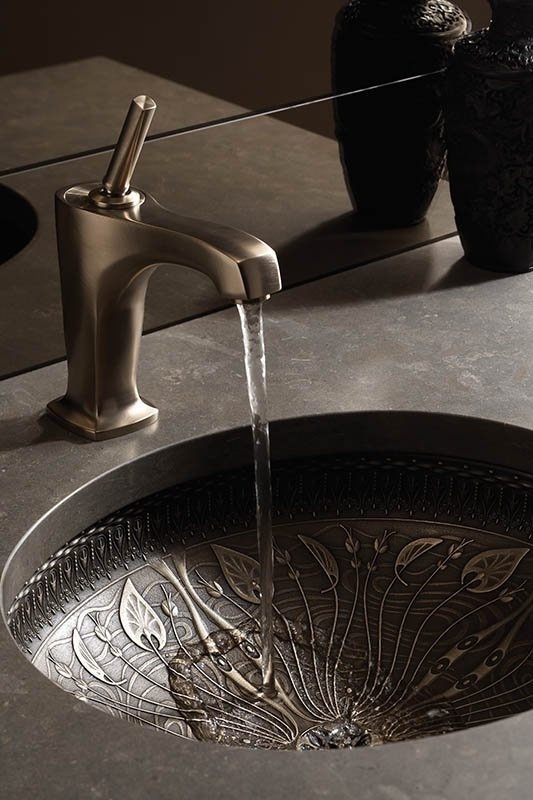 Start from tiles with typical Eastern patterns or concrete walls and bathtub; columns, rugs, mosaic and ceramic sinks and fanciful candle lanterns. 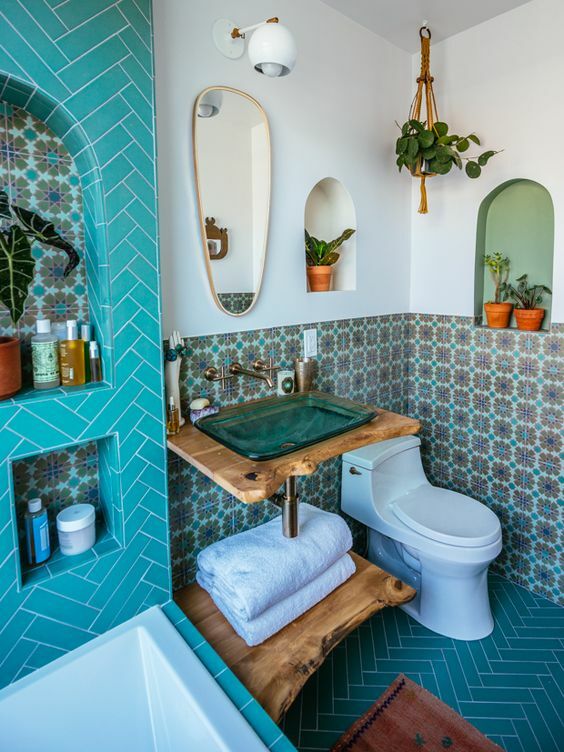 The colors in a bathroom shouldn’t necessarily be too bright like red or blue, you can choose white, light grey, blue or green. 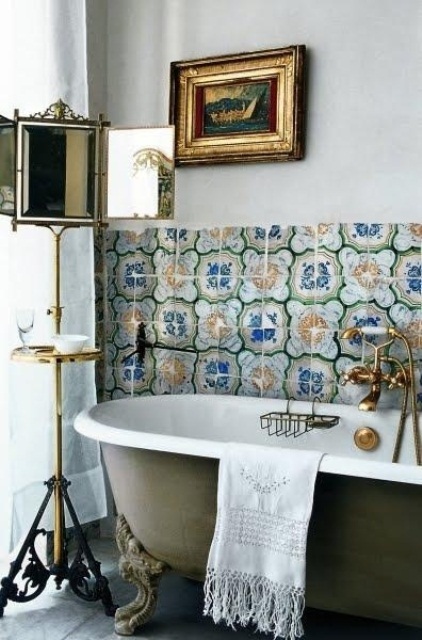 But if you want dramatic chic, choose blue with gold and black. 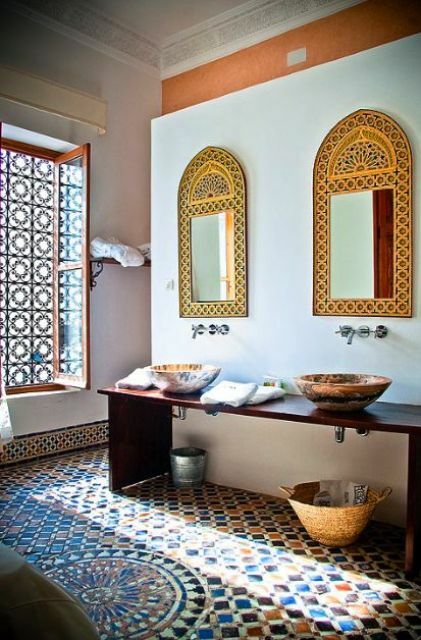 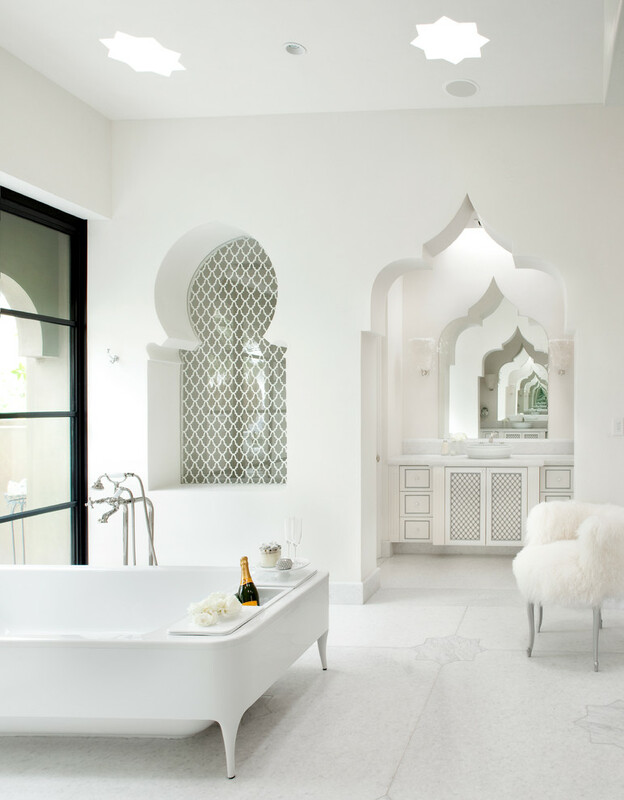 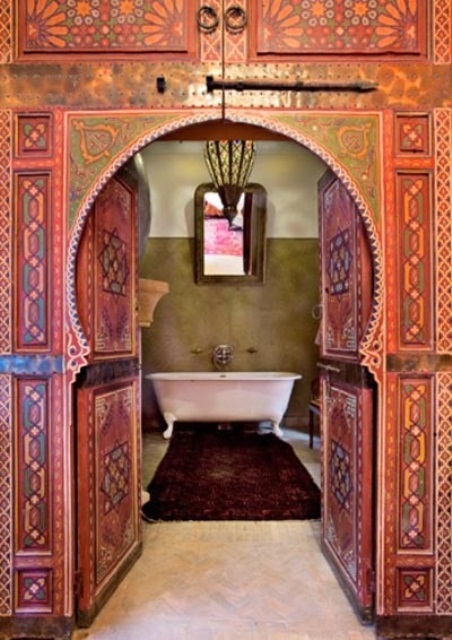 Add wooden furniture, curtains and voila, you’ve got a charming Moroccan bathroom! 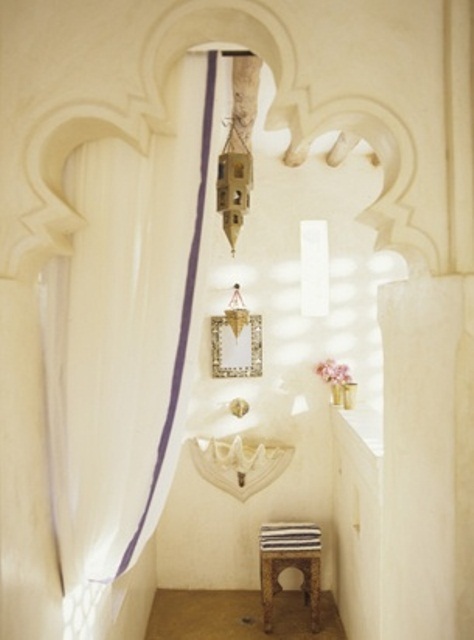 Neutrals aren’t typical for Moroccan spaces but if you love muted or neutral colors, keep them up! 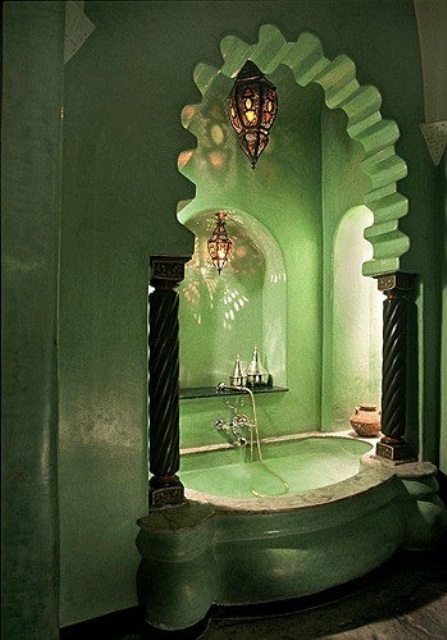 How to pull off Moroccan style then? 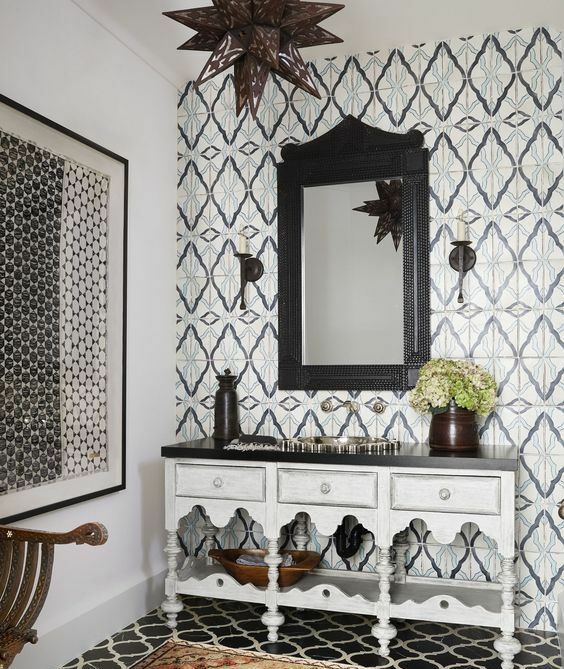 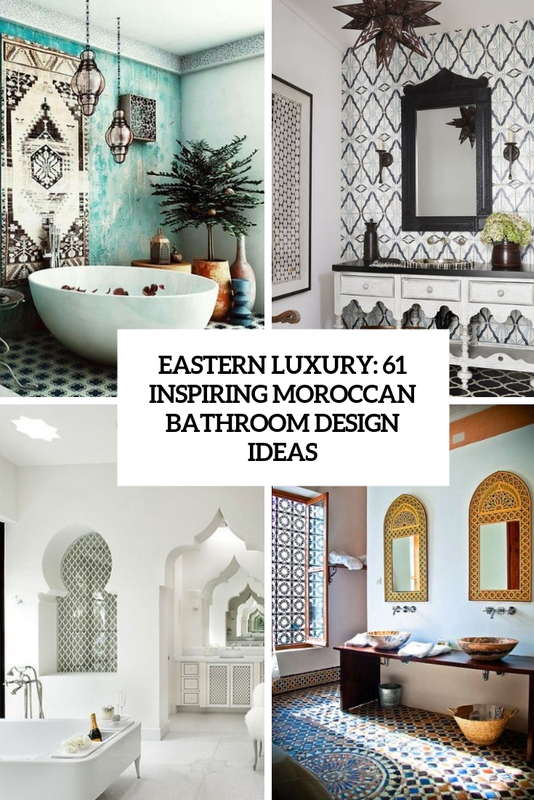 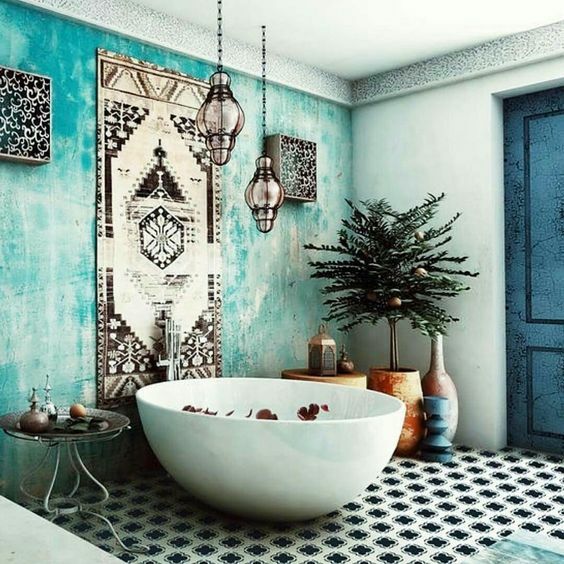 Use Moroccan-inspired tiles – with shapes and patterns that are typical for this country, add catchy pendant lanterns, potted greenery, metal hammered sinks and metal jugs as accessories. 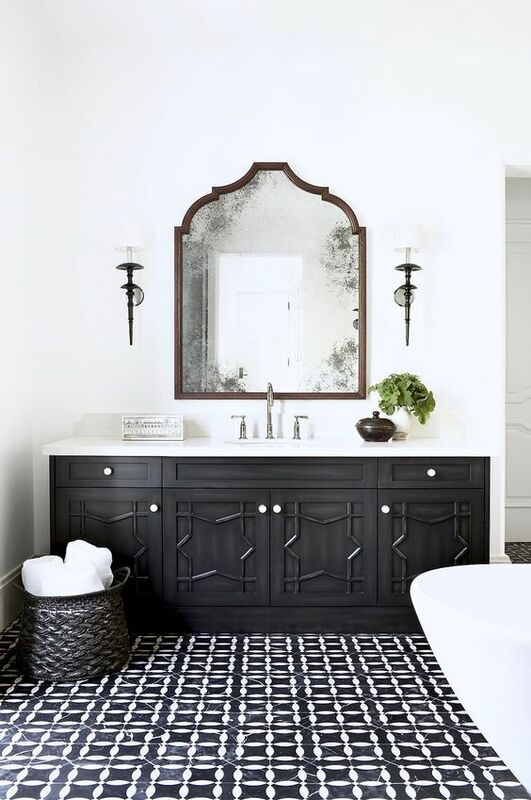 Go for tassel rugs, even on the wall, for a carved vanity and mirrors in gorgeous ornated frames. 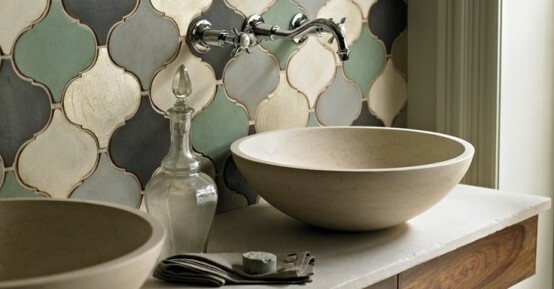 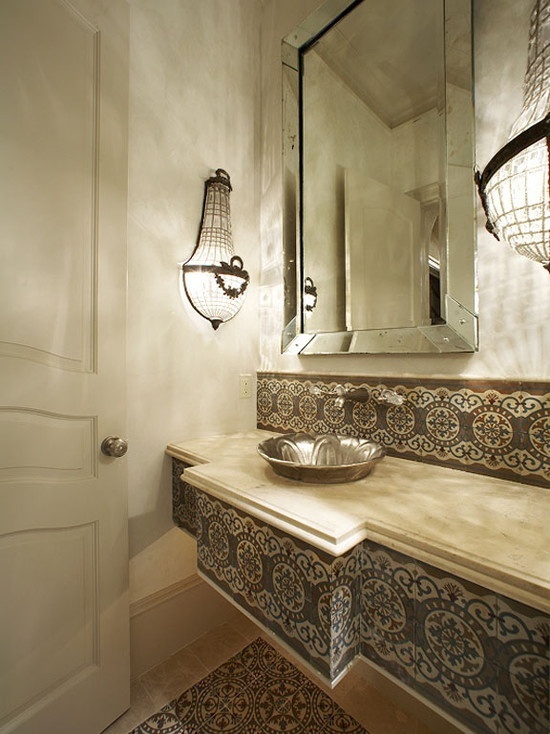 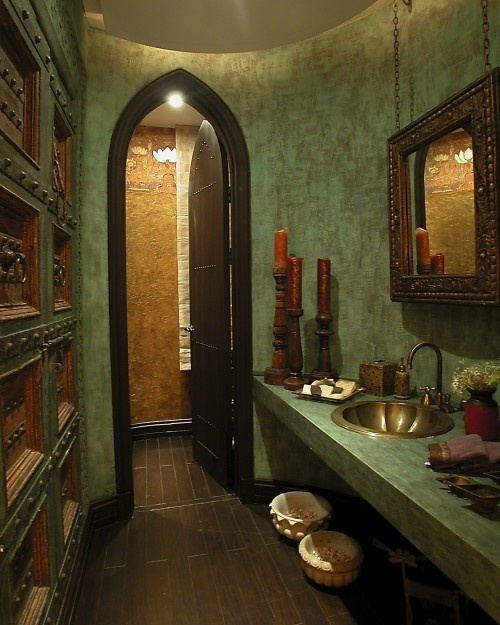 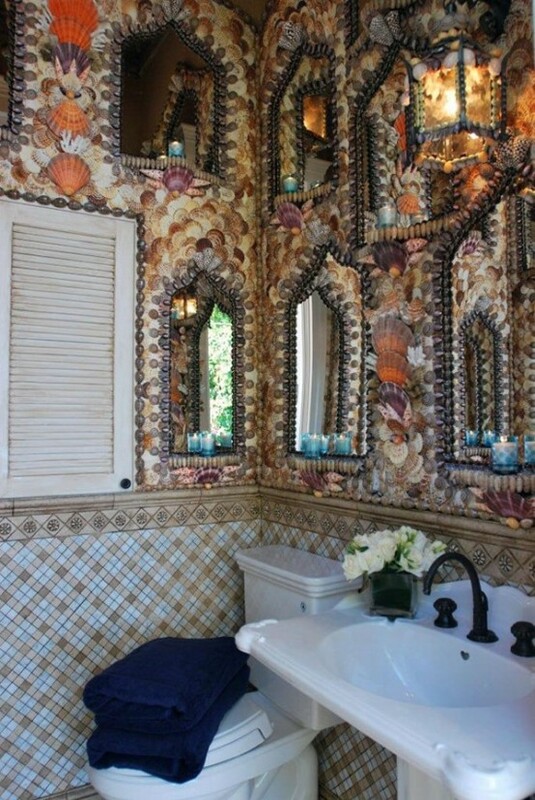 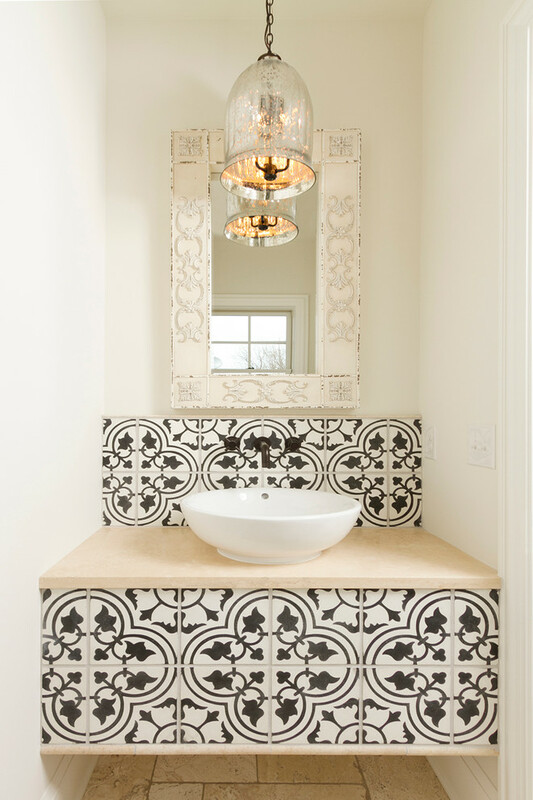 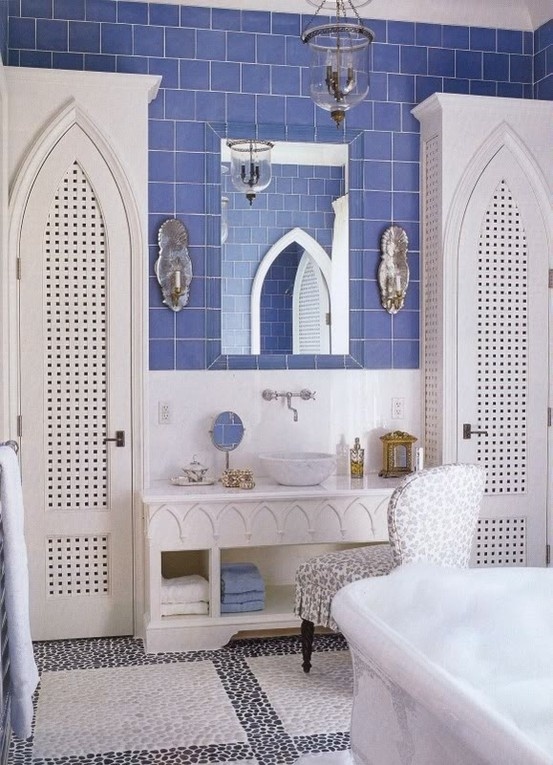 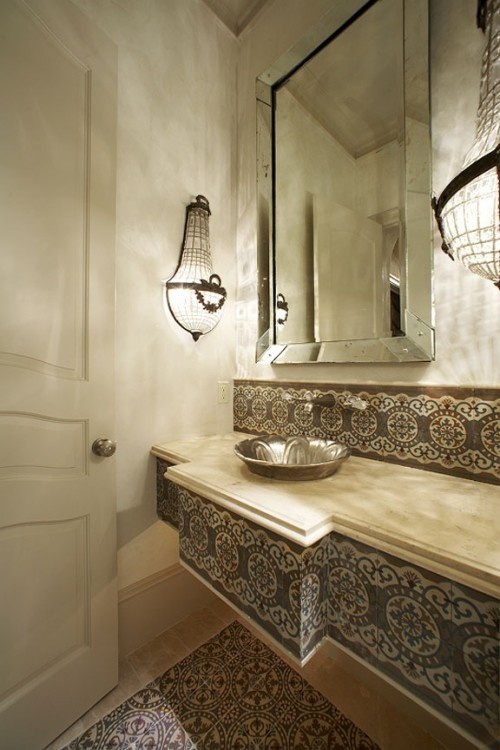 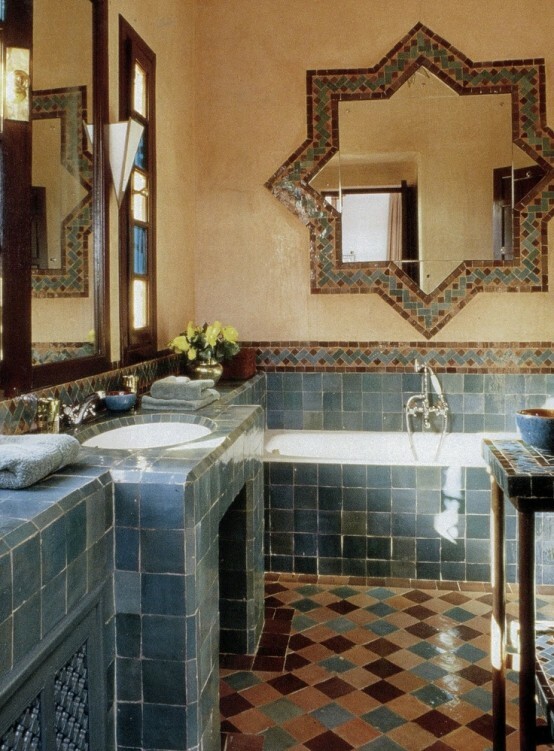 If you don’t have a beautiful carved wooden vanity, don’t worry, you may tile a usual one and it’ll look Moroccan. 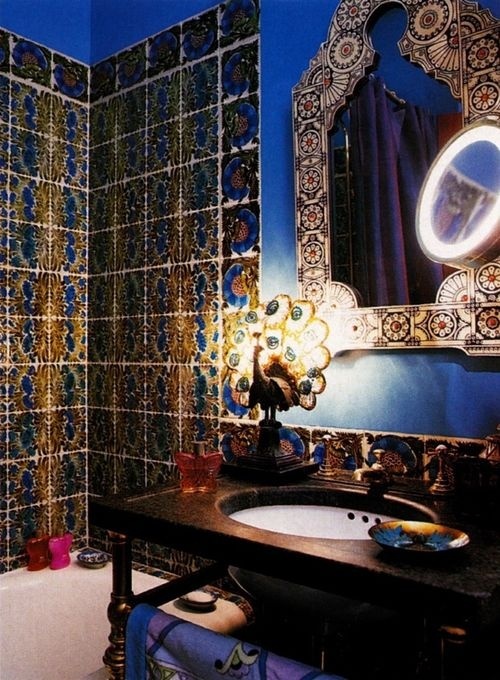 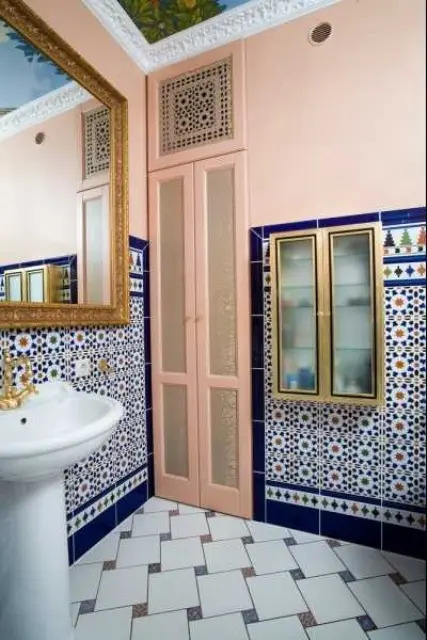 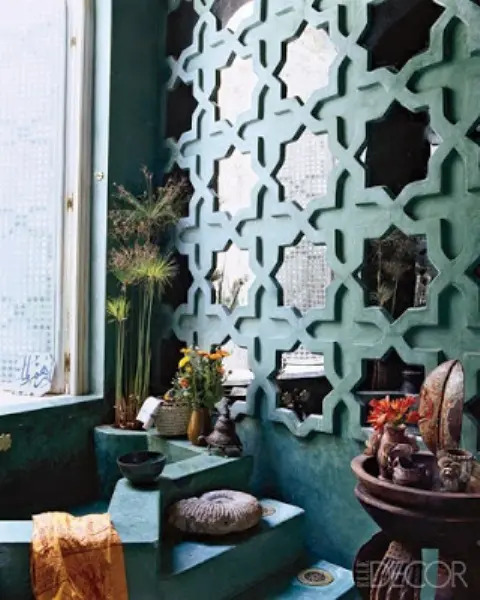 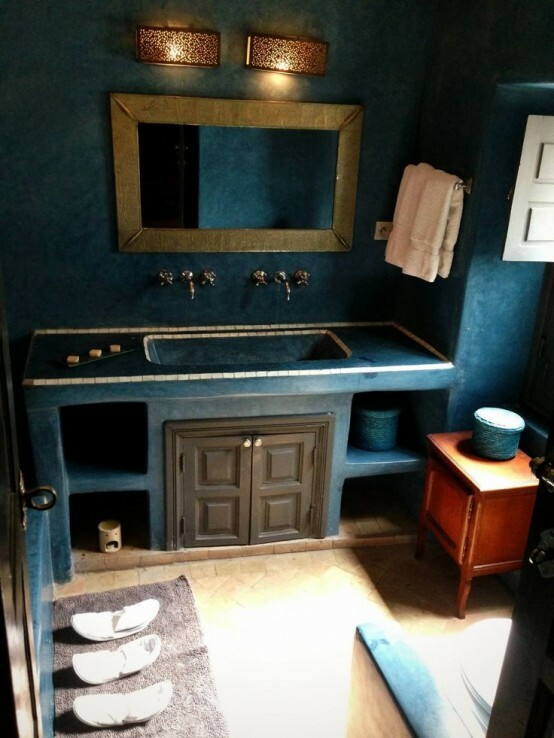 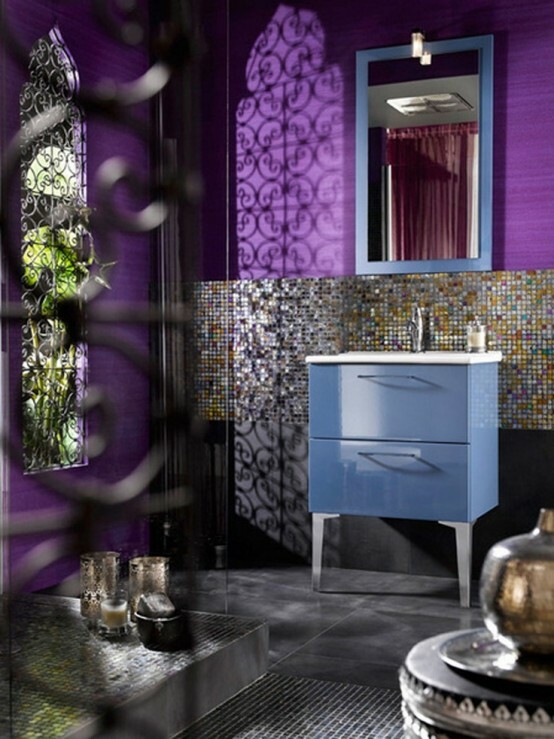 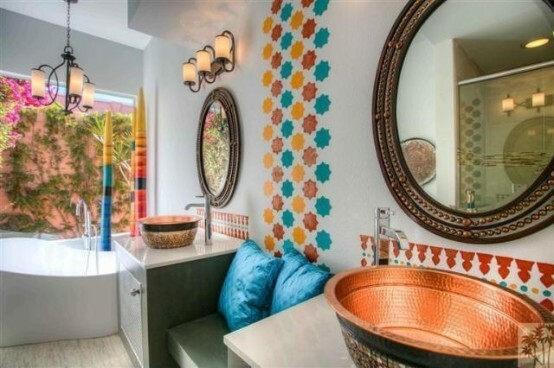 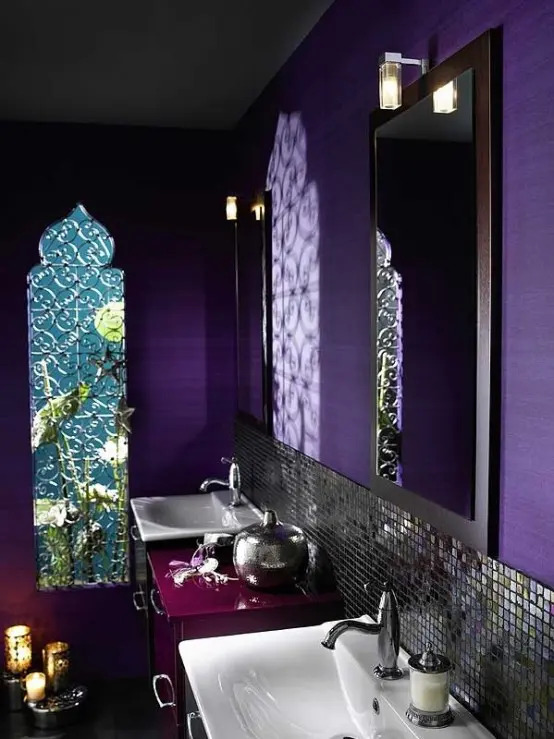 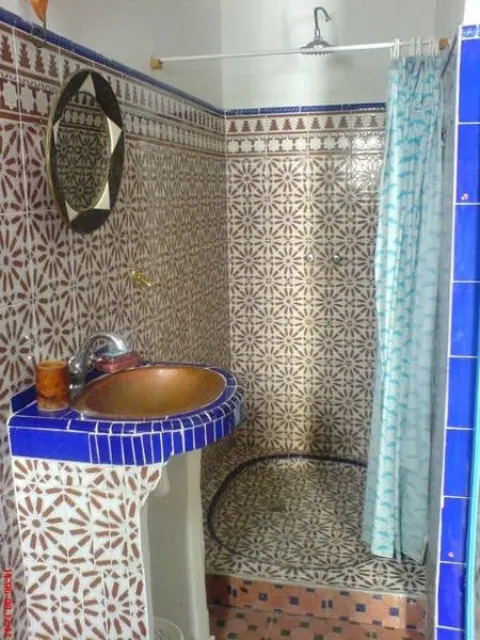 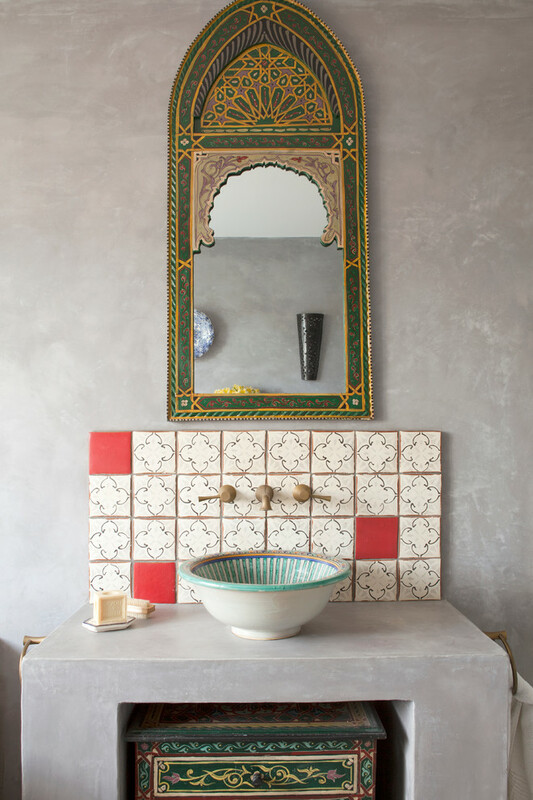 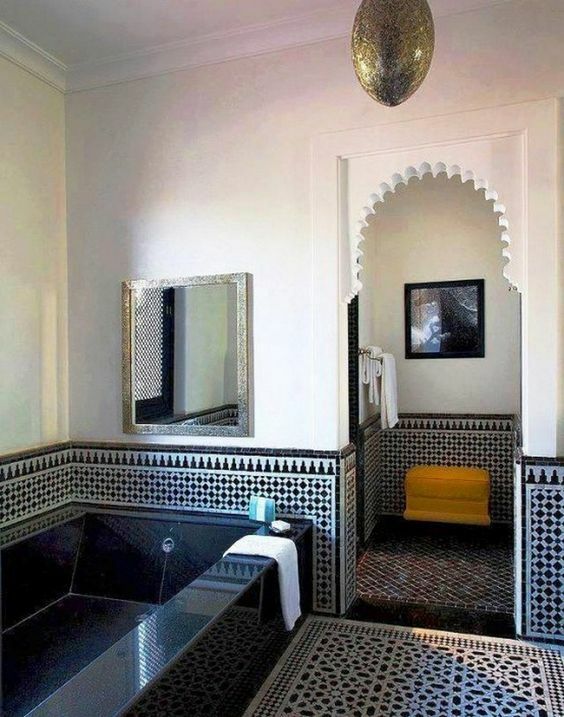 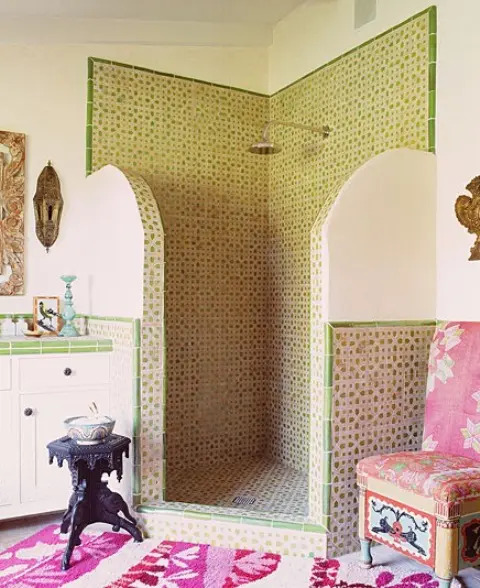 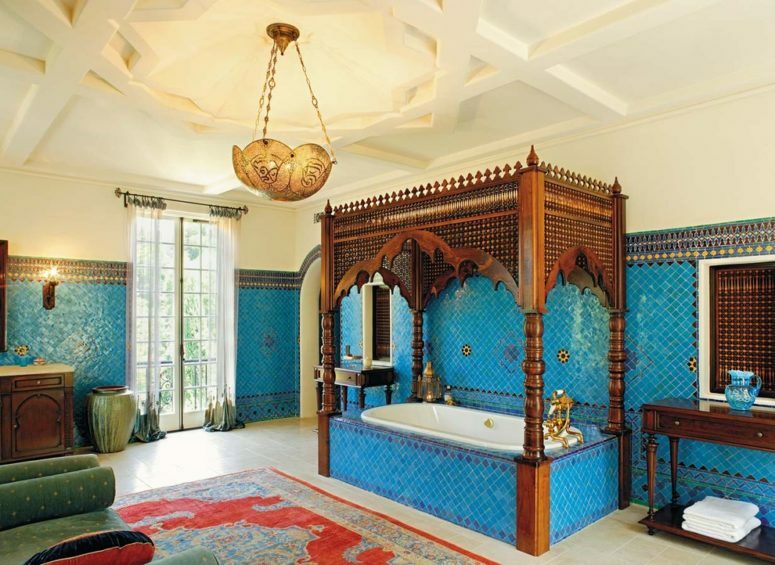 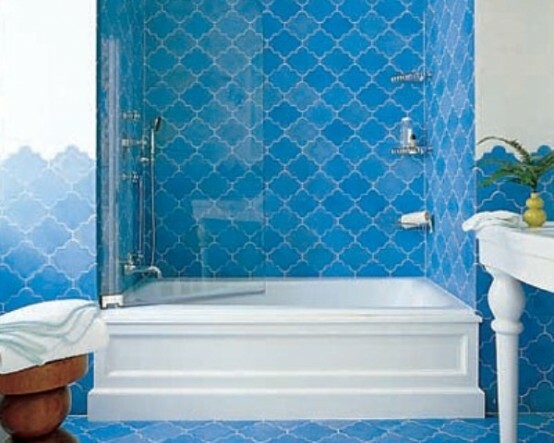 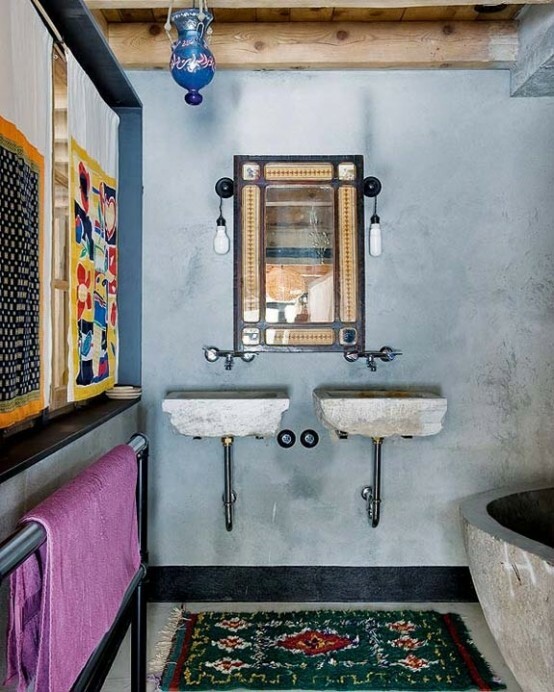 If you love bold colors, go wild with your Moroccan bathroom! 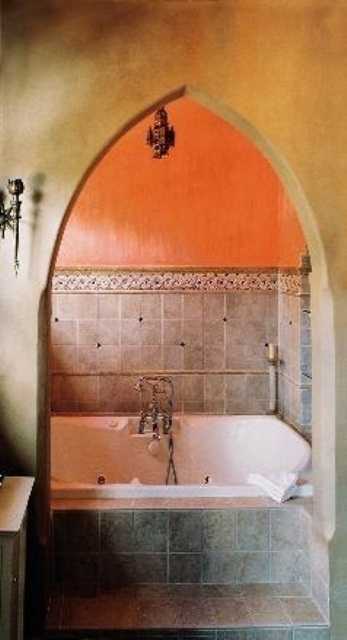 Incorporate turquoise, orange, green, purple, fuchsia and many other colors into your bathroom decor. 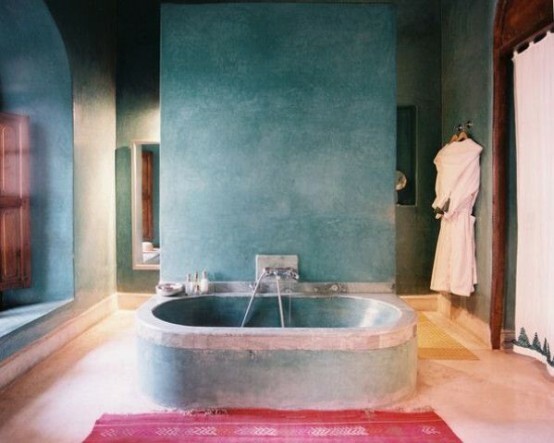 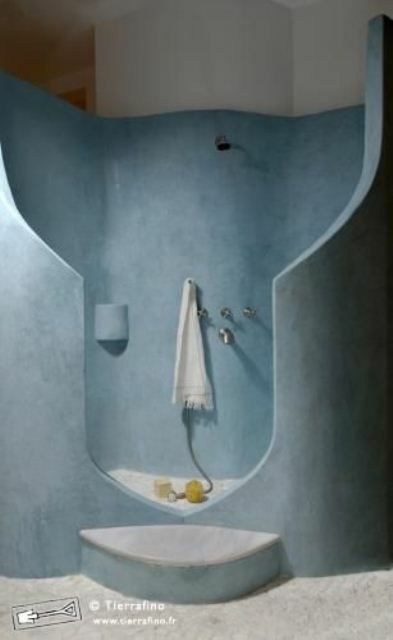 Play with tiles or cover the walls with plaster and make a tiled or concrete bathtub. 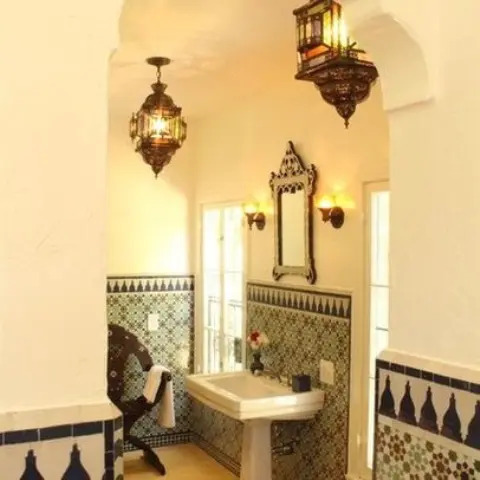 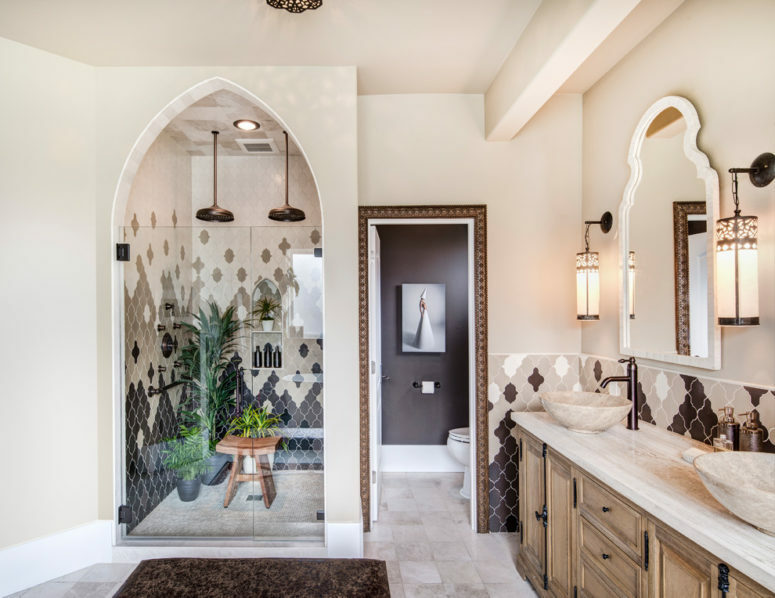 Create arched doorways and niches for candles and candle lanterns, hang some Moroccan lanterns and place them on the floor, go for stone tubs, ornate mirrors and beautiful hammered or painted bowl sinks. 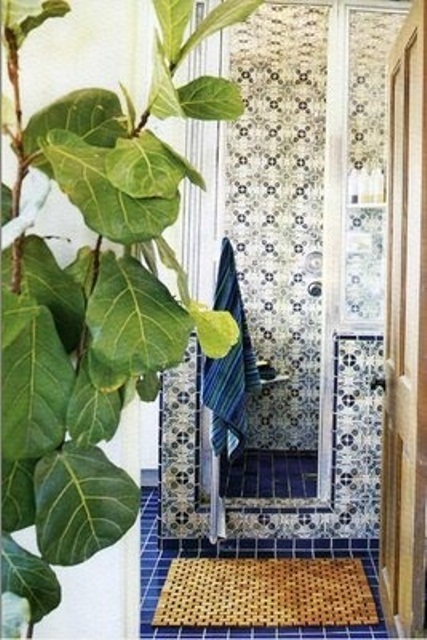 Don’t forget of potted greenery and other plants to create an ambience.